Situated in Leqing, Wenzhou in the southeast of Zhejiang Province, Yandang Mountain is one of the 10 famous mountains in China. It costs four and half hours from there to Shanghai by train. Yandang Mountain, which was formed 120 million years ago, is a typical ancient rhyolitic volcano of the Cretaceous period. Over the past 20,000 years, the volcano in Yandang Mountain has experienced four periods and several dozen eruptions. Thanks to multi eruptions, falls, revivals and rises, and the erosion by water and wind for millions of years, the present landforms were formed. Yandang Mountain covers an area of 450 sq km, and has more than 500 tourist attractions and eight major scenic zones. 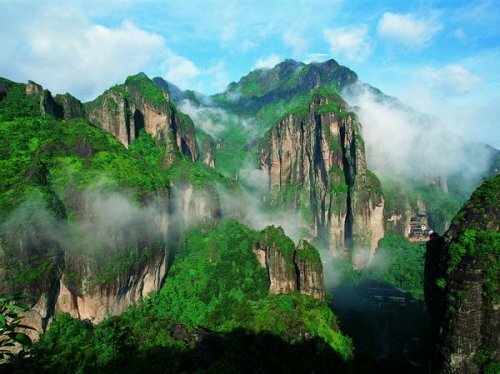 Of all the scenic spots in Yandang Mountain, Lingfeng Peak, Lingyan Rock and Dalongqiu Waterfall are the most famous, known as the “three perfections in Yandang Mountain”. Yandang Mountain features complicated landforms and abundant tourism resources. When one takes a step forward, the scenery will change; and the peaks show different shapes when they are viewed from different angles. The scenery in Yandang Mountain is mainly composed of peaks, waterfalls, caves and steep cliffs. The main tourist attractions in the mountain include the Two-palm Peak, Double Bamboo Shoots Peaks, Scissor Pak, Lotus Peak, Heavenly Pillar Peak, Flay Display Peak, Pingxia Peak, Dalongqiu Waterfall and Xiaolongqiu Waterfall. With a high elevation, all the peaks in Yandang Mountain rise abruptly from the ground, and the 100-m-high peaks and cliffs can be seen everywhere. It is almost impossible for tourist to climb the mountain as it is so steep. Going up the mountain along the undulating paths, tourists can appreciate oddly-shaped rocks and steep peaks. Yandang Mountain contains Dalongqiu Waterfall, Xiaolongqiu Waterfall and numerous streams. Now the streams get together to form a mirror-like lake; now they flow along the winding paths; and now they fall down, like a string of pearls scattered on the green water surface, presenting various types of white patterns.